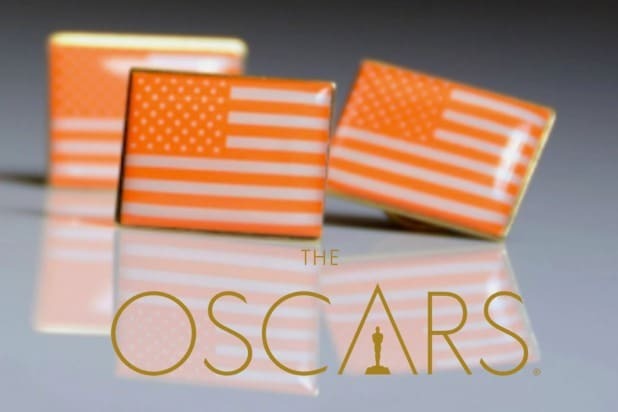 Attendees at the 2018 Academy Awards on Sunday will be turning their attention to gun violence by rocking orange American flag pins on designer dresses and dapper tuxes. According to People, some celebrities will be arriving on the red carpet wearing the bright anti-gun violence pin from Everytown for Gun Safety on their duds as a gesture of solidarity following the school shooting in Parkland, Florida last month. Tinseltown has been using fashion as a form of protest this awards season, with stars following a black dress code at the Golden Globes and BAFTAs, carrying white roses at the Grammys and BRIT Awards, and of course, wearing their Time’s Up gear. The 90th Annual Academy Awards will be broadcast live on March 4 at 8 p.m. ET/5 p.m. PT on ABC. "The Shape of Water" has the most nominations, 13. It won the Producers Guild and Directors Guild awards. It's a valentine to the art of cinema. Predicted winner: "The Shape of Water"
If Best Picture is so split between "Shape of Water," "Dunkirk," "Lady Bird" and "Get Out," shouldn't this race be a nail-biter between del Toro, Nolan, Gerwig and Peele? Nope. Just as it has in every recent year, the heat has coalesced around a single director, in this case del Toro. This seems to be one of the nine categories that are pretty much a lock. This is another of those locks. (In fact, all four acting categories are.) While Chalamet and Kaluuya are two of the year's big discovery, this award was Oldman's as soon as Focus began screening his all-but-unrecognizable performance as Winston Churchill. This is an Oscar standing ovation just waiting to happen. 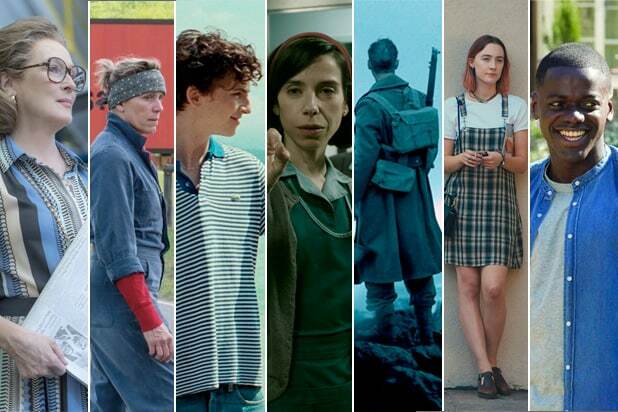 It initially seemed to be one of the year's most competitive categories, with McDormand, Ronan and Hawkins landing massive acclaim, Robbie sneaking into the field with a bold performance and Meryl being Meryl. But then McDormand, an absolute force of nature in "Three Billboards," startin g winning all the awards. And she's not going to stop now. Woody Harrelson, "Three Billb oards Outside Ebbing, Missouri"
Sam Rockwell, playing a dimwitted and thuggish racist who is one of the only people in "Three Billboards" to slightly change, won SAG and the Golden Globes and the Critics' Choice Award and BAFTA, which has made him a prohibitive favorite. Lesley Manvill e, "Phantom Thread"
Voters for all the precursor awards embraced the fun Allison Janney had playing Tonya Harding's monstrous mother, and Oscar voters seem all but certain to do the same. While voters occasionally decide that the best screenplay is the one with the most words, which would be good news for Aaron Sorkin and "Molly's Game," nothing seems positioned to challenge James Ivory's adaptation of the Andre Aciman novel. Predicted Winner: "Call Me by Your Name"
This is likely a very close race between "Three Billboards" and "Get Out" -- and while Jordan Peele wrote the year's most zeitgeisty movie and could easily win, "Three Billboards" is a showier piece of writing. Predicted winner: "Three Billboards Outside Ebbing, Missouri"
"Blade Runner" DP Roger Deakins, a pretty unanimous choice as the greatest living cinematographer, has been nominated 13 previous times but has never won, and his astounding work on the Denis Villeneuve epic ought to finally do the trick. Predicted winner: "Blade Runner 2049"
"Blade Runner 2049" / Warner Bros.
"Baby Driver" is such a virtuoso piece of fast-paced editing that it could well prove an exception to the usual rule that you need to be a Best Picture nominee to win in this category. But "Dunkirk," which simultaneously cuts between three different war stories taking place at different locations and different times, is an advertisement for its editing. It was a shock when the Costume Designers Guild gave its period-costumes award not to "Phantom Thread," the movie about a clothes designer, but to "The Shape of Water," most of whose characters sport lab coats or cleaning-lady smocks. But look for Oscar voters to recognize the movie in which the man makes the clothes and the clothes make the man ... and the women. This should be a showdown between the amazing futurescapes of "Blade Runner" and the richly detailed environments of "The Shape of Water" -- and the fact that voters like the latter movie better than the former one could tip the scales. Here's another lock, because only one of these films features makeup that is instrumental in an Oscar-winning performance. Before Gary Oldman could act like Winston Churchill, he had to look like Winston Churchill, and that was the considerable accomplishment of the "Darkest Hour" makeup team. Voters love a piece of music that instantly captures the mood of a film they admire, and Alexandre Desplat provides that in his music for "The Shape of Water." "Remember Me" is from a bigger movie but "This Is Me" is becoming a phenomenon at just the right time, which will probably give "City of Stars" writers Benj Pasek and Justin Paul their second consecutive song Oscar. Predicted winner: "The Greatest Showman"
Two previous Christopher Nolan movies, "The Dark Knight" and "Inception," have won in this category, and his "Dunkirk" should have the scale and drama to give him a third. Over the last 12 years, the same film has won in both Oscar sound categories eight times -- so when in doubt, it's best to predict a sound-category sweep. This year also lacks the kind of big musical nominee that often wins in the category, which will help "Dunkirk" in its quest to win another. The team for the "Apes" franchise has yet to win an Oscar for their visual effects work on the series, but we're guessing that voters will finally come to their senses and realize what an accomplishment the simian saga has been. Predicted winner: "War for the Planet of the Apes"
Has "Coco" lost anything it's been nominated for this year? If so, I wasn't paying attention. In a very close race, we think the Euro-centric nature of the Academy's international membership may give the slightest of edges to "The Insult." With none of the four issue-oriented films really standing out, it's possible that the serious vote will split four ways and allow the beloved French icon Agnès Varda to become the oldest Oscar winner ever for her and co-director JR's wry and delightful travelogue "Faces Places." The two strongest contenders are "Heroin(e)," a wrenching but also inspiring look at the opioid crisis in West Virginia though the eyes of three women (a fire chief, a judge and a crusading volunteer) on the front lines, and "Edith+Eddie," a character study of the country's oldest biracial newlyweds that leaves viewers utterly infuriated at government indifference toward the elderly. Typically, the film that wins in this category is the film that leaves viewers with some hope, which could give "Heroin(e)" a tiny edge. At the Oscar nominees luncheon, there was no bigger star in the room than Kobe Bryant, and nobody who posed for more selfies. And animator/director Glen Keane is a Disney vet almost as beloved in animation as Kobe is in basketball. Three of the nominees -- "DeKalb Elementary," "My Nephew Emmett" and "Watu Wote" -- are exceptional, fact-based student films that could not be timelier: "DeKalb" deals with a shooter at an elementary school, "Emmett" with a horrifying episode that helped trigger the civil rights movement, "Watu Wote" with Christian/Muslim tensions.